A clear understanding of power electronics and AC drives is crucially important in a wide range of modern systems, from household appliances to automated factories—and it requires cross-disciplinary expertise that many engineers lack. 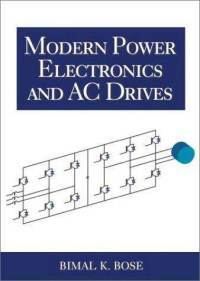 Now, in Modern Power Electronics and AC Drives, one of the world's leading experts covers every aspect of the topic, including crucial innovations such as artificial intelligence, advanced estimation, and sensorless control. This book is not only important as an advanced reference but also covers the material for one senior-level and two graduate-level courses. Dr. Bimal K. Bose discusses these key points and many more. Today's technology innovations make it possible to deliver higher performance, lower cost power electronics and drives for a wide range of industrial, commercial, military, utility, and residential applications. Furthermore, it can help more efficient use of electricity and thus contribute to environmental protection. If you're a practicing engineer, Modern Power Electronics and AC Drives can help you achieve these results, regardless of your previous experience.